The number of participants was just right – not too many that it felt too big, and yet not too small that it was difficult to network outside one’s area of specialty. There were a good mix of both basic science and clinical presentations, and a sufficiently wide (and yet not too exhaustive) array of topical infectious diseases and pathogens. There were also many first-rate international and local speakers. The conference venue – Marina Mandarin – was excellent. It is great that the Courage Fund had agreed to provide financial support for another four editions of this conference. Next year’s edition is likely to come in the form of several workshops rather than just talks/symposiums, in order to provide a more practical slant. I was unfortunately only able to attend the session that I chaired, which was on “Antimicrobial Resistance”. 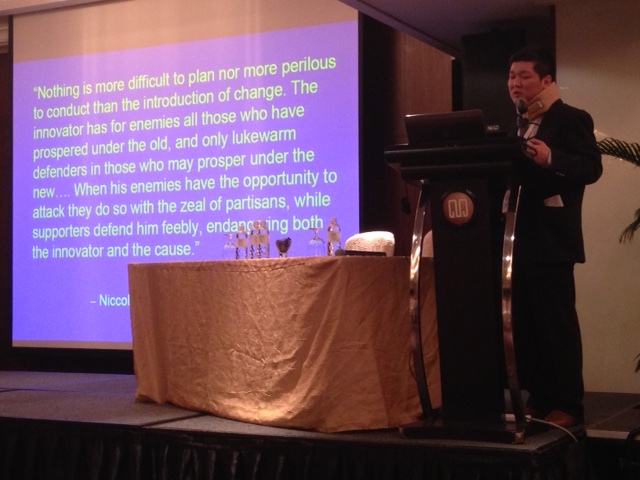 Prof. Victor Lim (who also has his own Wikipedia page!) from the International Medical University provided a snapshot of antimicrobial resistant pathogens of concern in the region, as well as what Malaysia is doing in an attempt to control the rising threat. He is a microbiologist by training, and is considered by many as being akin to an “elder statesman” in the area of antimicrobial resistance in Asia. A/Prof. Lim Poh Lian, who is head of the department of infectious diseases at Tan Tock Seng Hospital as well as the chair (for the past 6 years) of the National Antimicrobial Taskforce (the Singapore Ministry of Health’s official response to the problem of antimicrobial resistance), spoke about Singapore’s efforts to control antimicrobial resistance. A/Prof. Anucha Apisarnthanarak, chief of infectious diseases at the Thammasat University Hospital in Thailand and an acknowledged expert on infection control, spoke about the implementation problems and strategies of infection control in hospitals. 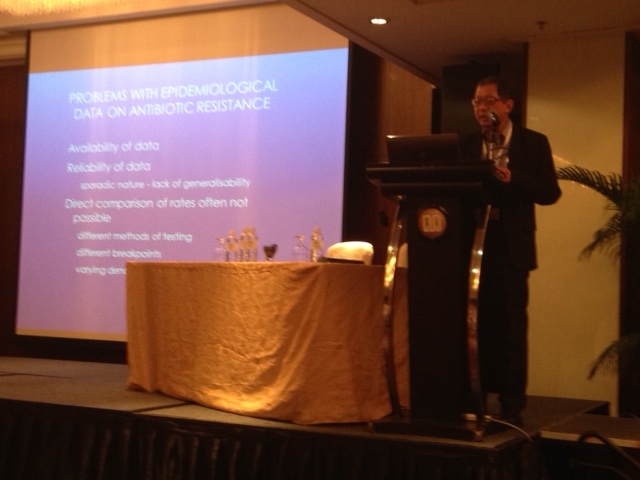 Prof. Victor Lim describing the issues of data heterogeneity with regards to antimicrobial resistance in Asia. A/Prof. 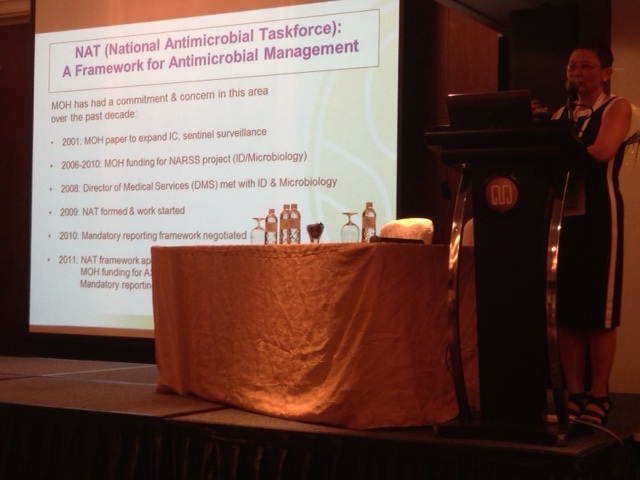 Lim Poh Lian detailing the Singapore MOH’s efforts at infection control (the slides had to be pre-vetted and approved by MOH!). I was very glad to see that NARSS was acknowledged on the slide. A “posthumous rehabilitation”, according to a fellow founder of NARSS! Prof. Anucha quoting from Macchiavelli when describing implementing change in terms of infection control. There were another two speakers that were included – local investigators that had their work selected for oral presentation. These were Dr. Ng Oon Tek from TTSH presenting on NDM-1 plasmid spread, and Dr. Indumathi Venkatachalam from NUH presenting on the ongoing prospective epidemiological survey of patients with carbapenem-resistant Enterobacteriaceae (CRE) in local hospitals. 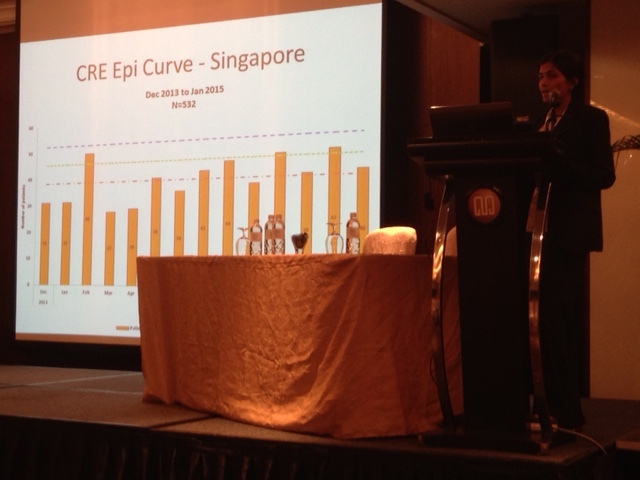 Dr. Indumathi describing the CRE epidemic in Singaporean hospitals. An excellent session overall. I certainly hope that successive editions of the Courage Fund ID conference will be similarly (or better) received, and that the passion, collegiality and hard work put it by current Singaporean organisers and researchers will continue over the next several years at least.